Tax is a tricky business so to help you on your way, the USA Property Guide run you through all the tax matters to consider after you’ve purchased property in the US. Following your property purchase in the USA, there are going to be a number of tax considerations that you will need to take into account, and factor into that all-important budget. Are you liable to pay tax in the US? You are considered a US resident for tax purposes if you have a Green Card or if you meet the Substantial Presence Test for the calendar year. To pass this test, you need to have been physically present in the US for at least 31 days of the current year, and 183 days during the last three years. If you become a US resident, bear in mind, you will have to file a tax return every year regardless of where you are in the world. If you become a US resident, bear in mind, you will have to file a tax return every year regardless of where you are in the world. The US has a double taxation remedy in place with the UK, which means that you won’t be charged tax on the same income in both countries – but if you are earning separate incomes in both countries, you will be expected to pay tax in the respective countries. 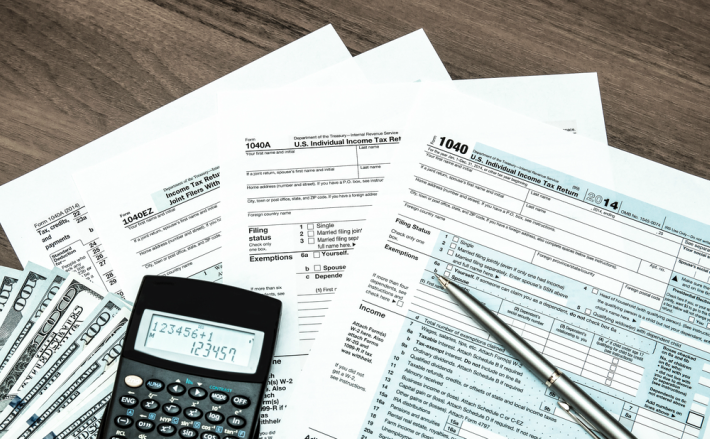 The US tax system is incredibly complicated, and you’ll be surprised how many loopholes and affecting factors there are, especially because there are multiple ways for each individual to file their return. For example, sometimes it proves more beneficial to file as a couple, and there’s also an option to file as a non-resident. Chances are that you will still have tax liabilities in the UK, from a salary or rental income for example. A tax expert will be able to guide you through the process and work out the best plan of attack for you in both countries. It is so important to make sure that you stay on top of the incomings and outgoings of your estate. If you are earning a salary from a US company, your income tax will be taken directly from your salary but you will still have to complete a tax return. This must be submitted by 15th April every year. If your visa is temporary, you won’t have to file this return. Anyone who has filed a tax return in the UK will know how much of a pain it can be – and for this reason, we recommend employing the services of an expert to educate you on the US tax system, and to make sure you take all of the necessary steps. You were ‘resident’ in the UK in at least 17 of the 20 income tax years of assessment, ending with the year you make the transfer. If you are spending a considerable amount of time in the USA, but are still considered domiciled in the UK, you will be subject to inheritance tax in the UK. If you bought your property to let out to holidaymakers, it will be located in either a short-term or long-term rental zone. If your property is located in a short-term rental zone, you will be required to pay a hotel tax (dictated by the state) on all rental agreements of less than seven months. Your real estate agent will be able to advise you on how much this will be before you buy. To ensure you are clued up on all your tax liabilities, we recommend consulting an independent financial advisor, who can also help wrap up all tax matters in the UK. Contact them today. When transferring funds between the UK and the USA to make these tax payments, you need to manage your transfers effectively to ensure you don’t pay more than you should due to poor exchange rates. Contact Smart Currency Exchange today to see how they can help you manage these payments, and save you money.